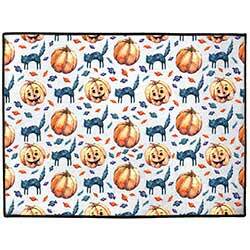 Bring a spooky look to your floor or front door with one of our Halloween rugs! Jack o'Lanterns, witches, pumpkins, and more! 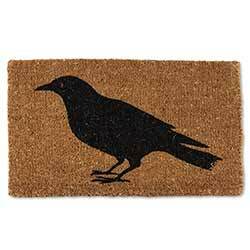 Add a splash of color and personality to your front door, entryway, or kitchen with one of our indoor floor mats. 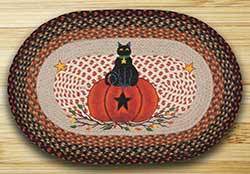 This one features watercolor artwork of black cats, pumpkins, Jack o'Lanterns, and tiny candy - perfect for October! Add a splash of color and personality to your front door, indoor floor, or your porch with one of our indoor/outdoor floor mats. 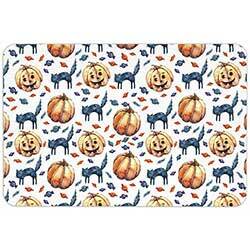 This one features watercolor artwork of black cats, pumpkins, Jack o'Lanterns, and tiny candy. 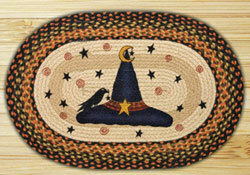 Witch Hat Oval Patch Braided Rug, by Capitol Earth Rugs. Artwork designed by Susan Burd. Measures 20 x 30 inches. Made of 100% natural jute.